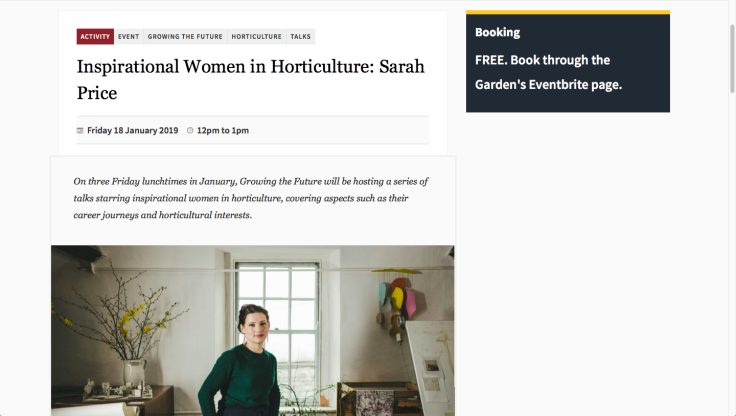 Botanic Garden of Wales’ has an excellent series of talks called Inspirational Women in Horticulture, I’ve drawn up my own list of inspirational women, some of whom are in horticulture. Nia and Sophie run The Peoples’ Orchard, a local Pembrokeshire project that promotes biodiversity to encourage pollinators. They gave me my first break in presenting a forest garden talk and their group were the first visitors to Forest Garden Wales. This is in addition to putting on planting and pruning workshops. Thank you Nia and Sophie. June is a mighty force of inspiration and positivity, a gardener and permaculturalist. She helps organise the Permaculture Tywi @PermaTywi group in Carmarthenshire. They were my first paying guests to tour the forest garden and the reason why I now have the confidence to offer workshops and tours. Thank you June. Not only are Sara @Saralimback and Lou @loujnicholls proper gardeners, the kind I aspire to be, they are also moderators on the #gdnbloggers Twitter chat and Facebook group. This is a fantastic community for any gardener who blogs. They’re prolific on that there social media, raising spirits, asking questions and making connections. Thank you Sara and Lou. @margaretroach has been hosting the A Way to Garden podcast for like, forever. It has been a delight to listen in a Netflix-style back-to-back binge to all the available podcasts and bathe in that ocean of expertise. Hopefully some learning has seeped in! Thank you Margaret.